Tiny. Gentle. Powerful. These are the only ways I can describe Anna Mae. She was my wife’s grandma, and we affectionately called her “grandma” (I know…we were not original). She probably weighed 95 lbs. if she were holding a medicine ball after just eating a large meal. Don’t let her size fool you though, because if you were in trouble with her, you knew it, and you never committed that offense again. I promise you. I was her favorite. At least that is what she told me until my brother in law, or father in law were in the room. Then, when she was alone with them, she would adjust her loyalties to make them think they were her favorite. I knew the truth, though. It was me. Grandma loved Jesus more than you could imagine. She sang hymns out loud whenever she felt the urge, and her prayers were powerful and made things happen. 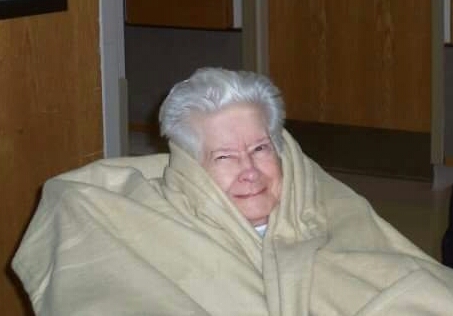 On one of her last days on earth, she woke up in the middle of the night singing “Don’t Fence Me In” randomly and when we were told this, we all laughed and gave her a hard time about it. She loved to joke and laugh. When she smiled with her thin, wrinkly, beautiful lips there was pure joy that filled the room. She took laughter seriously, and even her death was a joyful time. When we moved back to Indiana, we lived with my in-laws for about 9 months until we could find a home elsewhere. This was in 2007, and during this same time period, was when Grandma lived with us. We knew that the end of her life was coming, and that she would soon finally get to see Jesus. Up until the last few weeks, she would still walk around after long naps to socialize with us. The bedroom was on the first floor, and for some reason she believed she was going “down stairs” when she would venture into the living room. There were no stairs between the rooms. I think she knew, but she just wanted to make us laugh. The day she died was a sad, beautiful, happy, and celebratory day. The moment was full of joy and laughter. She slipped away from us, while we were surrounding her, straight into the arms of Jesus, who she loved more than any human. Her most intense desire was to be with the God she loved and to hold her son, who she lost when he was a young adult. I can picture the elation she had as she walked up to the gates of Heaven and received her reward. At that moment, all the pain and suffering would have been forgotten. Life finally made sense. Grandma deserved to receive that reward. She deserved to die and embrace the God she loved more than life itself. Anna Mae Esary died September 17, 2007. She had the last laugh. I miss her.